A lunar eclipse occurs when the moon is full and its light is blocked by the earth’s shadow. A full moon is traditionally a time of fruition and harvest, but when eclipsed it heralds, instead, hidden fruits and obscured results. Nothing is quite as it seems. If we think we’ve failed, think again – all is not lost. If we’re congratulating ourselves on unbridled success, best take a moment to step back and check the details: things may not be as hunky-dory as they first appear and more work may be called for further down the road. 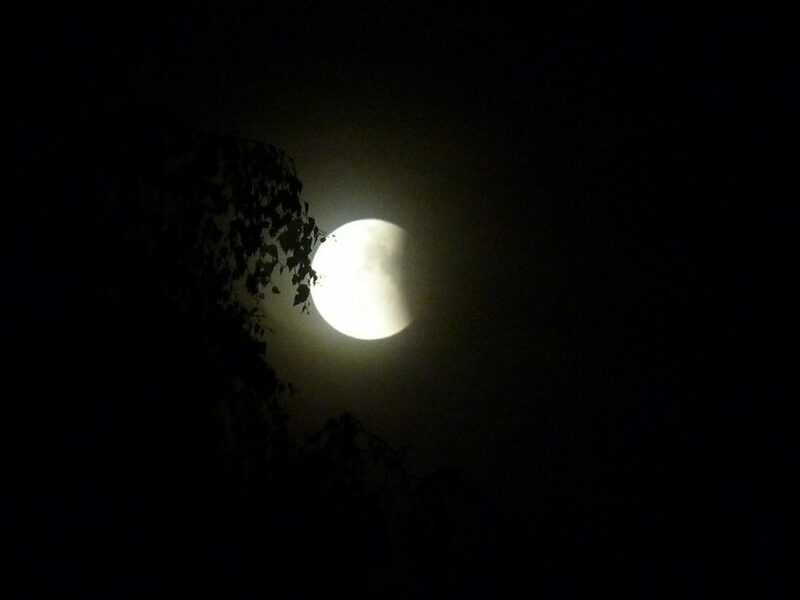 A lunar eclipse is a time of mystery and magic, revealing the hidden face of who we are and what we do. It offers a precious opportunity to see more deeply into the consequences of how we live our lives. As such, reflection at this time is best focused on outcomes reaped thus far and any changes we can make to better hone future harvests. In part, the moon relates to childhood, when we’re at our most vulnerable: dependent on nurturing protection and wise encouragement. A lunar eclipse may therefore bring to the fore memories, thoughts and feelings from early life, illuminating they’re impact upon us. We may want to make a gesture of gratitude towards those who so lovingly cared for us back then. Or we may need to acknowledge hurts inflicted and pain caused – intentionally or otherwise – by those we looked to for succour and support. We may be moved to do both: acknowledge the efforts made by those struggling with their own pain and unable, therefore, to effectively meet our needs. Or it may be necessary to maintain distance from those who shaped our past, knowing it to be vital for our own well-being. Whatever our childhood experience, it can become a defining issue at the time of a lunar eclipse as we reflect on all that made us who we are. We may feel especially vulnerable in the surrounding days. Emotions may run high, tempting us to judge our feelings as wrong or unnecessary. If we are beset by anger at past hurts or present wounds we may struggle to accept that we could feel so hateful towards others or ourselves. It is, however, vital we allow ourselves to feel, to grieve, to rage. Acceptance of these difficult and sometimes over-powering emotions is important at a lunar eclipse, for through these feelings wisdom is eventually revealed, helping us embrace their message and integrate their energy into our body, mind and soul. The unconscious may speak loudly too, when ordinarily we ignore its feathery touch. If so, it is time to recognise the parts of ourselves we’ve banished into darkness, refusing to acknowledge them out of denial and fear. Unsettling though these experiences can be, they set the scene for greater emotional freedom as we learn to accept thoughts, feelings and memories exactly as they are. This is the only way to step fully into the present as the moon waxes once more towards full, and what is often a solar eclipse two weeks later. As such, a lunar eclipse signals the need to be gentle with each other and ourselves. To recognise that the human life can be intensely challenging and we can help ease some of that angst simply by the ways we treat each other. Reaching out the hand of friendship to someone in pain may become the difference between life and death. A smile and quick chat in the checkout queue could make the day for someone living in lonely isolation. Stopping to smell a flower, to watch the birds, to chuckle at an amusing advert on the side of a bus… all can contribute to our own well-being amidst the myriad pressures we face in the modern day. A lunar eclipse reminds us just how vital it is to attend to our inner world, our emotional life, to listen to the storm within, not push it down in the hope it will eventually go away. It won’t. For that storm is you and me and everybody: feelings and emotions passed down through the ages like a baton in a relay, denied and ignored, repressed and avoided, simply wanting and waiting to be heard. If you want to understand how a particular eclipse impacts you more personally, look to the house where it falls in your birth chart. Here you will experience its direct impact as the affairs and issues of that house are magnified and sensitised, along with your feelings towards them. Any aspects the eclipse makes to natal planets, or conjunctions to the Ascendant, Descendant, Midheaven or Imum Coeli, will accordingly influence how the eclipse energies are experienced. Look especially to the personal planets (Sun, Moon, Mercury, Venus, Mars and sometimes Jupiter) and to conjunctions, squares and oppositions, which will be most acutely felt. The consequences of previous activity in the eclipse house may not be as clear as first appeared and some time may be needed before you can accurately evaluate success – or otherwise – of recent efforts. You may find that feelings in this area change quite substantially during the eclipse time, so it can be best not to make too many big decisions until the eclipse has passed. Once your feelings have settled somewhat, it will be easier to tell if the emotional shift is lasting and to be acted upon or was a passing phase of recalibration and release. Look also to the position and condition (aspects and strength etc.) of your natal moon, for its impact upon your life will be emphasised during a lunar eclipse. You may find that the issues your natal moon reflects in your chart are particularly brought to bear in the house where the eclipse occurs. For example, if your natal moon is in your 7th house of relationship and the eclipse is in your 10th house of career and public life, relationships will have a particular impact upon your work and public activity during the eclipse time, and you may find other people trigger strong emotional reactions for a while. Remind yourself that this is a passing phase and your reactions are best explored to unearth your real feelings about the situation, rather than taking them out on others without deeper reflection. If, however, a lunar eclipse brings to a head issues which have been simmering beneath the surface for quite some time, it may be very clear that a watershed moment has arrived and cords need to be cut, alliances forged or feelings expressed which have previously been silenced and held-back. Some honest self-appraisal can help you discern if this is the case: are your emotions at this time new to you, swirling you up into a storm of activity you may later regret, or are they familiar but louder and more insistent, demanding, finally, to have their say? Only you can know which it is, and self-honesty is vital now more than ever. It’s also worth considering the house ruled by the moon in your natal chart: that is the house with Cancer on its cusp. Here you will also feel the impact from a lunar eclipse, but often more in the long-term than at the actual time of the eclipse. Once the eclipse season has passed and things begin to settle you may see a gradual change in this area over the following few months, as the consequences of the eclipse ‘bed in’ to your life. Your emotional responses in this area will mature as a result of the eclipse and you will gain a broader and wiser perspective upon the affairs of this house and how best to move them forward.